Poet Nicole Callahan: Well, the butterflies were a given. And then I thought: lollipops, a bottle of wine. I thought: concrete nouns! But that’s why I’m not a visual artist. To me, the visual is always the concrete, but to artists, it’s so much more. Artist Amy Meissner: As a mother, I think I have been in this same gift shop, in this same space, at this same moment in time with my own daughter. I’m sure I composed this very same poem, but never wrote it down. Artist Amy Meissner: This was an existing piece of artwork. I work with vintage linens, embroideries and found objects. The wool butterfly needlepoints I incorporated are from an unknown maker, but are dated 1973, which is nearing the year that I began to ask my own mother for help embroidering. When I read Nicole’s piece, I knew immediately that this was the right piece to accompany her words and the voice of this poem. Poet Nicole Callahan: The circles. The wholeness. The notion that we can become something completely different and still be so true to who we are. Artist Amy Meissner: I love how both the poem and the artwork incorporate beauty and terror with the same amount of subtlety. Poet Nicole Callahan: I recently had a very satisfying collaboration with the artist Joseph Quintela. I would send him two couplets, and he would choose the one he wanted to create an art panel out of, then he would create it and send it to me, and I would write two more couplets, and he would choose again. I loved letting go. I loved letting the art make the choice. So often, I confuse my artist life with my emotional life—or is it my emotional life I confuse with my artist life?—anyway, gah, the power of letting go, the power of the image…bliss. Poet Nicole Callahan: Putting my daughters to bed tonight, I sang them “You are my Sunshine.” When I got to the second verse, I realized: THAT was it. Gah. Gut-punch. Artist Amy Meissner: Sorry, I can’t help myself: “Drowning Butterflies,” by Bipolar Sunshine. Poet Nicole Callahan: Oh, hell yeah. Just started Joy Williams latest collection of short stories (WOW! ), and I’m lapping up Paul Celan because I am CERTAIN he has all the answers for me. Artist Amy Meissner: I’m loving a collection of essays sent to me by a dear friend—The Empathy Exams, by Leslie Jamison. The book came wrapped in a scrap of embroidered linen and came festooned with just the right amount of sticky notes poking from the top. Lovely. Poet Nicole Callahan: Recently, the Gowanus section of Brooklyn has been overtaken by folks who want to run the artists out (don’t even get me started! ), but I was invited by my youngest daughter’s pre-school teacher (how cool is THAT?) to come to her show to support The Gowanus art world. There, I fell in love with Amy Weil’s paintings. I mean, if you want anyone in the universe to teach your child how to draw a circle, it’s THIS woman. Artist Amy Meissner: I recently viewed a retrospective at the Anchorage Museum called “Living Alaska: A Decade of Collecting Contemporary Art for Alaska Museums.” I was really proud of all the artists who were part of this show, and it gave me great hope to see that Alaska has a vibrant culture of acquiring contemporary art for various permanent collections. It was a stunning show. Poet Nicole Callihan’s work has appeared in, among others, The L Magazine, PANK, Forklift, Ohio, Painted Bride Quarterly and as a Poem-a-Day selection from the Academy of American Poets. Her books include SuperLoop, a collection of poems published in early 2014, and A Study in Spring, a chapbook which she co-wrote with Zoe Ryder White. Her latest chapbook, The Deeply Flawed Human, will be released by Deadly Chaps Press in Summer 2016. 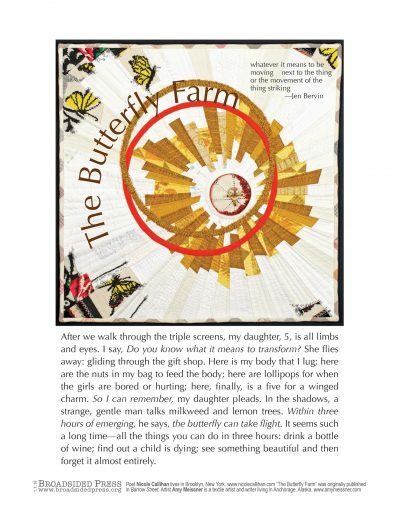 “The Butterfly Farm” was originally published in Barrow Street. IMAGE: “Reliquary #3: Catch” (25.75″ x 25.75″) Vintage domestic linens, silk organza, wool, abandoned embroideries & quilts, found object. Machine pieced, hand embroidered & quilted, 2015. Photo credit: Brian Adams. Nicole Callihan preparing to vectorize at Cafe Pedlar, one of Brooklyn’s FAVORITE coffee shops for poets turned moms turned poetmoms. Photographed by Mandy Field, who is also, and forever, becoming.